JMC Spiral (Flexible) Bush Bearings are made out of high quality spring steel, which withstands for high temperature environment. # MOULD : Back Up Plate Assembly and Foot Roll Scaffold Assembly. # SEGMENT ‘O' : Rolls. 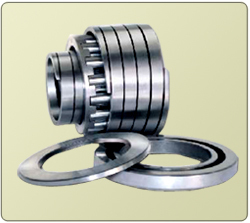 These bearings are also being used in Roller Hearth Furnaces. Space restrictions force us to use thin walled bearings. 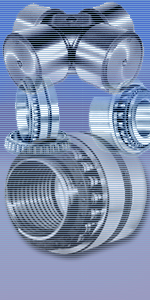 JMC Spiral (Flexible) Bush Bearings are very much suitable for such applications. Thin walled Spiral (Flexible) Bushes allows more space for rolling elements with Maximum diameter. This will press particles into the coil gap of the Spiral Bushings, while rolling over dust and foreign particles. This results in the smooth running of the bearing rollers. JMC Spiral (Flexible) Bush Bearings can be supplied with various combinations of side rings and labyrinth rings as per the customers demand.